Animals and faeries are two of my main loves in life...and I intend to combine the two to create some magic in this blog. I give daily single-card readings from the faeries' oracle deck by Brian Froud and Jessica MacBeth and if that whets your appetite, personal in-depth readings are available. I will also send distance Reiki to any pets or animals anywhere in the world...all you have to do is ask! 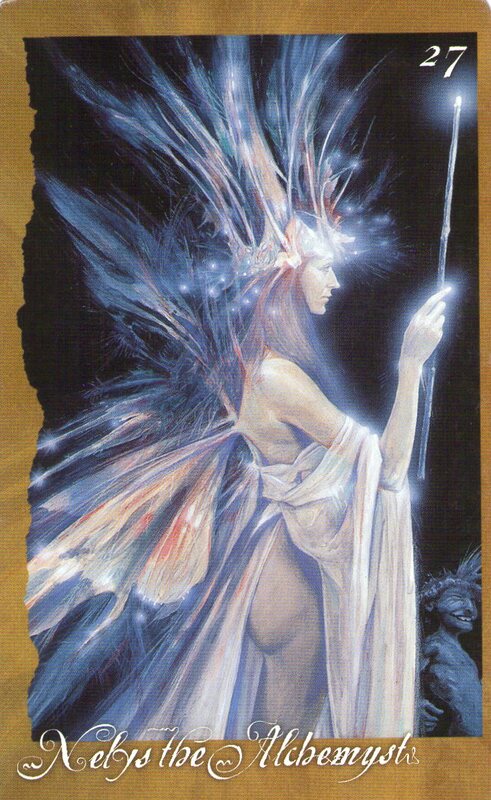 This is the card of inner transformation and irrevocable change. When Nelys turns up in a reading, get ready for things to happen - both inwardly and outwardly. The stuck becomes unstuck, the blocked begins to flow again and you might find yourself having to run to keep up with the speed at which things are moving. You may even be surprised by the direction things start to take as it might not be what you expected...rest assured though, it is the direction most beneficial for you as this transformative process takes place. Old attitudes and behaviours will not do any more which is why these alternate paths (which you have probably never even considered before) are now opening up to you as your plans, your dreams and desires start to change. Things will never be the same again, you will never go back to what you were before, but don't panic! This is absolutely for the best. For the last eight years or so, I have consulted my Faeries' Oracle deck of cards, by Brian Froud and Jessica MacBeth, regularly and trusted them completely, but only over the last few months have I started to do readings for people around the island. They are proving to be phenomenally accurate and popular, and it gives me such a wonderful buzz of gratitude and joy when I see people inspired, uplifted, comforted, excited, relieved, encouraged, or just plain bowled over by the messages they are receiving. So, it occurred to me that this was something I could actually share with people world-wide by offering on-line readings. If you would like a personal in-depth reading, then please let me know. I will meditate with the cards, tune into your energy, then my intuition and the faeries will guide me to selecting the nine cards containing whatever message is for your highest and greatest good. I'll then mail you with the reading. Faeries, of course, are the guardians of nature and animals, so it's no surprise really that my Reiki attunements led me to focusing my energies on healing animals. Reiki is an amazingly powerful, yet gentle, form of healing and animals respond so well to it. One of the things I love about Reiki is that it can be sent as distance healing...I don't have to physically be with the animal...I just need a photograph and to know where he or she is. Sending Reiki remotely is every bit as effective as a hands-on treatment, and when it comes to animals, it is often the most appropriate and most effective way to heal. Once again, if anyone would like me to send Reiki to a pet or animal – for anything from illness or injury, to behavioural issues, to emotional traumas, or even just for a treat – then please contact me and I'll be happy to help. Donations are always deeply and genuinely appreciated but they are completely voluntary and I would not want anyone to feel obliged. My motivation comes from the heart and I consider it a privilege to be in a position where I am able to offer these wonderful gifts to anyone who could benefit from them. If it feels right to make a donation, great...if it doesn't, great! I'm looking forward to many magical connections through this site, and an opportunity to work with the faeries for the higher good....and for the animals! After dropping out of the "rat race" almost 5 years ago, life just became more magical by the day!! We do create our own realities, you know, and the one I consciously created was where I get to live on a beautiful, light-filled island with a wonderful hubby & 3 gorgeous cats, living my dream & following my bliss. And here I am! !